When requesting a recommendation for your LinkedIn profile, it’s important that you request the recommendation from within LinkedIn’s interface. Whatever you do, don’t send the request for a recommendation via an outside email address. Emailing the request makes it difficult for your contact to figure out how to provide the recommendation. By sending the request from LinkedIn’s recommendation page, your contacts can easily click the link that LinkedIn provides, making it easy for them to give you a recommendation. Hover your mouse pointer over the down arrow next to the View Profile As button in the top section of your profile. Select Ask To Be Recommended. Click the drop-down arrow and select the position the recommendation is for. Enter the name of the person in the empty field. As you type, LinkedIn suggests contacts with similar names. Select the person from the drop-down list. 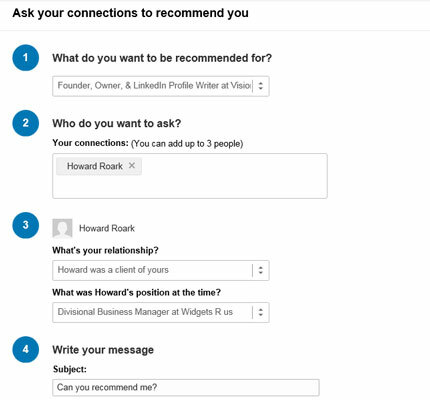 LinkedIn allows you to ask up to three different people per recommendation request. I highly suggest only asking one person per request. It’s important to personalize the request, and that is impossible if you are asking numerous people at once. Choose your relationship to the person. You have numerous options. Read through the list carefully and choose the relationship that most closely echoes yours. Unfortunately, there is no “other” option, so you must determine the best fit. Luckily, the other person has a chance to make changes, so if he or she doesn’t feel you used the proper relationship option, he or she can change it for you. Choose the other person’s position at the time from the drop-down list. The drop-down list contains a listing of the person’s experiences as listed it on his or her LinkedIn profile. Change the Subject line of the message if you are so inclined. LinkedIn prepopulates the Subject field with the title, “Can you recommend me?” This is a perfectly acceptable subject for the message, but you may change it if you wish. Directly below the Subject field is a pre-written recommendation that LinkedIn provides. As I have stated, it is best to add the recommendation for the person or at the very least, guidelines to what you want covered in the recommendation. Click the Send button when you are ready to send your request. Your request for a recommendation is sent as a LinkedIn message. Depending on your LinkedIn settings, you may also receive a notification alert via email.